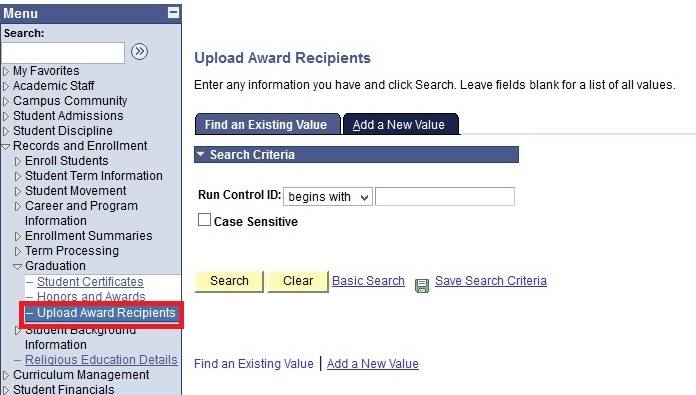 This function allows the users to upload a batch of award recipients. Download the Award Recipients template from here. Open the Upload Award Recipients template in Microsoft Excel. The data in each column should follow the bellow format. The column separator is comma ‘,’. StudentID 100004988 StudentID should have 11 characters. Career PRIM Refer Academic Structure Page in Online Help. Program PRMRY Refer Academic Structure Page in Online Help. Plan (level) PRMRYYR2 Refer Academic Structure Page in Online Help. Comments Distinction on the NSW Science Exam Enter comments on the Student's award. 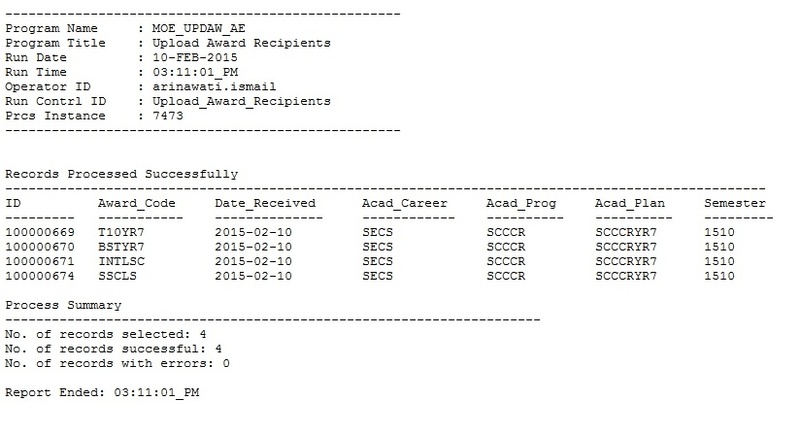 Fill up the Award Recipients Details in the Excel template. User must make sure there is NO comma(,) in the Comments column. User must make sure the data is separated by comma (,). Fill in Run Control ID field and Click Add button. Format Example: Awards_Recipients. Run Control Id must not be blank and has no space. Select the External File from Selection Tool dropdown. 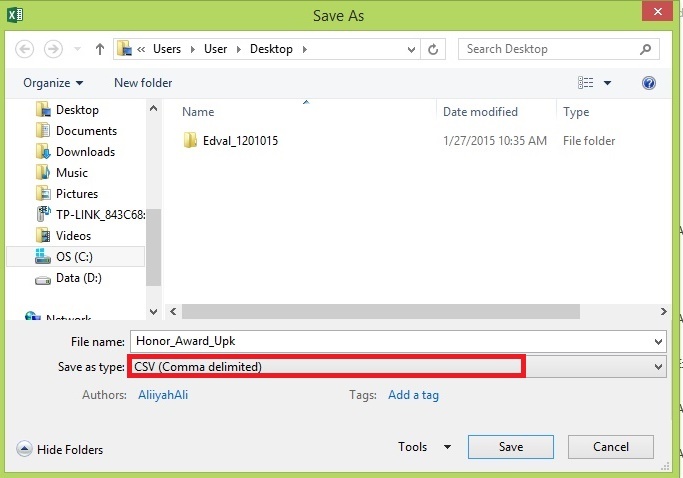 User must save the Excel template as .csv(comma delimited) and it is recommended to remain the csv file open. Click Upload File button and upload the file with .CSV format. An error message will appear if you upload the wrong file format. Click onto Preview Selection Results to view the data uploaded. Click Run button to run the process. 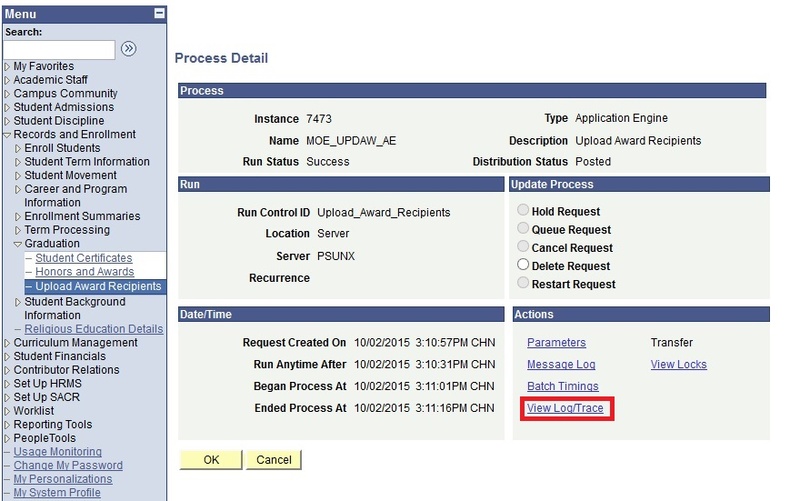 Click OK button at the process scheduler request page. Click on Refresh button to refresh the process monitor status. Click on Details link when the Run status has changed to “Success” and Distribution Status changed to “Posted”. 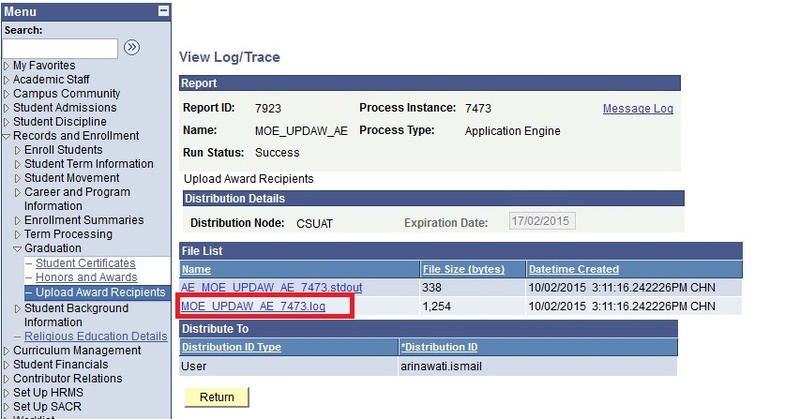 Click MOE_UPDAW_AE.log file to check the result of the uploaded data files. Any corresponding error messages will be displayed in the log file. 1 User Upload the correct Award Recipients Details User will be able to view the report of the Award Recipients details uploaded successfully. When user clicks on View Log/Trace link, the log file will show the no of records selected and the no of records with errors. 2 User upload duplicate values When user upload duplicate values, user will get a success for the process. When user clicks on View Log/Trace link, the log file will show the no of records selected and the no of records with errors provided with Error Descriptions. 3 User upload file where the Comments column has comma(,) When user upload file where the Comments column has comma(,) Eg: Comments - "Test, for Comma", only the text before the comma will be entered into the system. The text after the comma will be omitted. 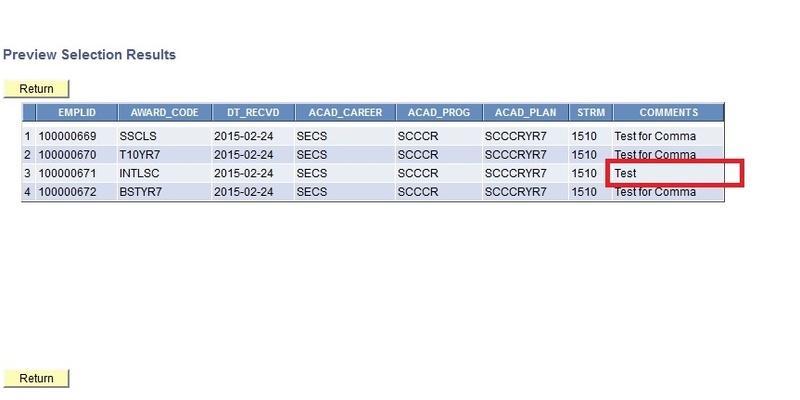 4 User upload incorrect Award Code, Career, Program and Plan (Year). 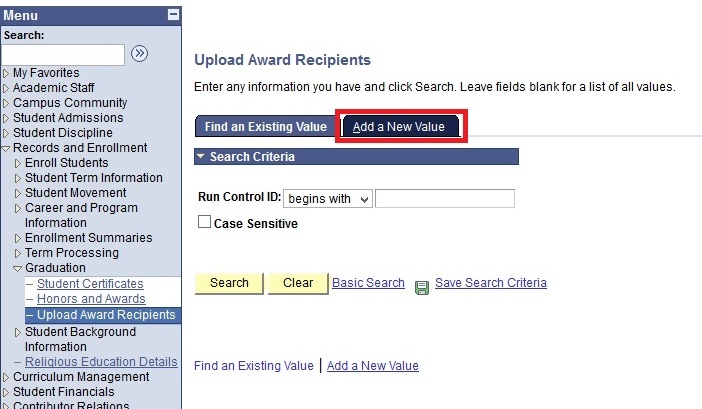 When user upload incorrect Award Code, Careerc Program and Plan(Level) column, user will get a success for the process.